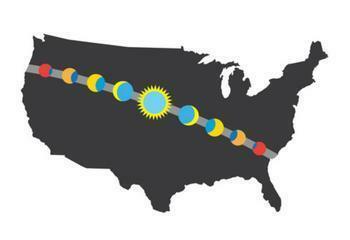 By now you probably know about the total solar eclipse on August 21 and the crush of people expected to travel to the 70 mile wide strip crossing the U.S. from Portland, Ore., to Charleston, S.C. In that narrow band of land, people will be able to observe the complete blackout of the sun as the moon casts a giant shadow. But let's face it, even with hundreds of thousands of people crowding into this area, most of us will be outside the 70 mile wide path next week. What will we be able to see? Carlton “Tad” Pryor, a professor in the Department of Physics and Astronomy at Rutgers University-New Brunswick, says it will be pretty spectacular, even outside the 70 mile zone. But at its peak, the moon will only block out part of the sun. How much it blocks out will depend on how far you are from the 70 mile wide zone. In New Jersey, for example, pretty far north of the total blackout zone, the moon will block out between 70% to 80% of the sun. Unless you have ISO 12312-2 certified safety glasses or filters, you should never look directly at a partial eclipse. But Pryor says there are some "old school" ways to observe a partial eclipse without looking directly at it. If the sky is clear at the beginning of the eclipse, stand in a leafy tree’s shadow and look at the ground. Pryor says the smallest spots of sunlight will make little crescent shapes, showing the changing shape of the sun as the moon crosses in front. You can also make a small hole in a piece of cardboard, aiming the hole at the sun. Hold a white sheet of paper under the hole. The light coming through the hole will begin to change shape as the moon passes between the earth and the sun. What has sort of gotten lost in all the build-up to the eclipse is those of us on the ground will need a nearly cloudless day on August 21 to experience its full effects. If it's an overcast day, you won't be able to see the shadow move across the sun, though you will notice it start to get dark. The closer you are to the 70 mile wide zone, the darker it will get. No matter where you are, remember that homemade filters or sunglasses – even very dark ones – are not safe for looking directly at the sun.